I recently got a larger tank for my crayfish as she was getting bigger and also a new filter along with it. 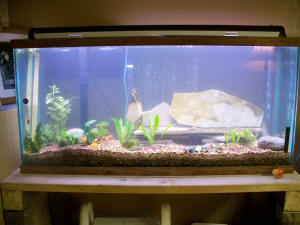 How can I go about using the old tank to aid with the cycling of my new one? Like to seek your help. 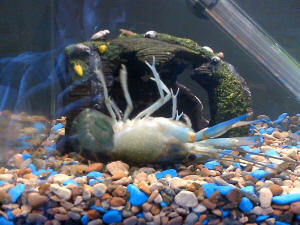 Is it weird that my crayfish is often in this position? There's no filter. He had shifted the mini stones and kinda stacked it higher so he can be in a more "comfortable" position . The big stone was for him to climb.. instead he used it as a hiding corner. I also do on the air con in my room at night. About 24degree Celsius. Is that fine for him? I am planning to get a 7.5 OR 10 gallon tank for my crayfish and I need help setting it up. Firstly, can I keep possibly maybe 2 sucker fishes in there to help clean the tank better? 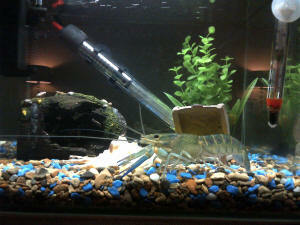 My crayfish is about 7cm large and I'm afraid he will eat the fishes. often do I change the water and how many % do I change each time? Thirdly, for the water quality, do I need the water to be at a specific pH? very important for their survival.<Correct> And I don't think I need a heater right? I live in the tropics so the water should be warm enough as the surrounding temperatures go as high as 38C and as far as I know crayfish can't survive well in heated water. to molt in probably the next week) and I can't really decide which to get. I don't think the water temperature will ever be as high as the surrounding temp so I should be fine. Shouldn't calcium supplements help decrease mortality rates that are caused by molt deformities? <Yes, and Iodine as well. Add when molting. I'm afraid the diet I am planning to give (fish flakes and occasional greens and treats and possibly algae wafers too)may not be enough. As always, feel free to contact us again, and don't forget to send pictures. Good luck Darren. Cheers, Gabe. What other fish can I keep with the crayfish? (The 10 gallon tank will probably look too empty if there is only 1 crayfish in there with no other fish). Also, should I get any plants and if I should what kind of plants are easy to maintain but won't be eaten by the crayfish? So... being a 16 year old Asian living under your parents, obviously things don't always go out the way you want it to. (I don't know if it's good). My crayfish is a lot more lively with all that extra oxygen from the water flow of the filter and I am kinda relieved now as I don't have to check on him every hour to see if he's still alive (he was a lot less mobile very unresponsive before I got the filter). Hopefully after my exams, I'll finally be able to get a bigger aquarium. For now, here are some pictures. Hi, what is the minimum size container to house a crayfish? I currently have it in a 10-gallon tank but a friend will baby-sit it at her house while we are out of town, so we would like to put it in a smaller container (easier to carry). Thanks. feeding them will minimise any risks even further. Seem reasonable to you? I have a problem that you may be able to help with. I keep a Red Claw Crayfish (Cherax Quadricarinatus) and he has chewed through the cables to the filter and heater in his tank causing a very low electrical current to pass through the water. I have tried positioning the heater and filter so the cables are out of the water but he climbs up them and pulls the cables back into the water. The electric current doesn't seem to affect him as he is moving and feeding as normal. Is there anyway of making the cables 'chew proof'? Hi WWM crew - firstly, thank you for a great resource! I have learned so much but still have a few things I am puzzled about. I live in South Africa and in July I got a "lobster" as a pet. I think she is a Procambarus species? See the attached picture. We were told she is a female. I am not sure how old she was when we got her but she has moulted three times since we've had her and is now approximately 8cm long. She lives by herself in a tank about 25cm x 15cm. The temperature is kept at 24 degrees Celsius and we have a water filter. So far all has been going well. We had been feeding her the Tetra Tabimin tablets but recently changed to the AquaPlus bottom feeder tablets as we were told they were the same thing but cheaper? I am not sure if it's coincidence but a few days after we changed her food she started "itching" a lot - scratching all over but especially under her tail near her swimmerets. I thought it was because she was going to shed. To my horror, I came home the following day to find her tank full of tiny little white "worms" floating in the water and stuck to the glass. After doing some reading it seems these were Planaria? I cleaned the tank and all seems fine again. I am wondering if the new food caused this Planaria bloom? The next morning I awoke to find our lobster lying on her back, tailed clamped tightly shut. Initially I thought she was dead but after yet more reading it seems she is laying eggs? It is two days later and she is still lying on her side/ back and seems very withdrawn (mostly in her cave). She is eating though (we went back to the Tabimin). I cannot see under her tail as it is tightly clamped shut. Today I also noticed a spider web-like substance on the pebbles in front of her cave? Here I am asking for your help again. Missy (my female Yabby pet) has her tail curled up to her body in the last two days. She held it like that all the time, which is abnormal. Before she only did it when she needs to run or claim a rock. Is that a sign of sickness? She is the only one in the 2" tank. I change water change 25% every week. Ph is at 8 and 2 drops of iodine every time I change water. and nitrate = 10. Tested last week. The reason I did not test this week is because through internet reading, it seems best for the tank to go through the cycle naturally, without adding any chemical liquid. So if there is nothing I could do about it, there is no point to test the water. But the question is am I right? Should I buy the Stress Zyme to speed up the cycle? My name is Danielle and I am from Melbourne Australia. I got a pet Yabby. Through all the reading on the internet, I am trying to give him the most pleasant environment to live in. So I am writing to you to check if I am doing the right things and I have a question on Iodine. So far he is doing he fine. Do you suggest anything else? or should we change something that we are doing? Next is the question of iodine. I have purchased the Coral Colos A Halogens (I2, Br2, F2) Supplement from Red Sea (Coral Coloration Program). The label reads Iodine/Halogen complex that promote the pink colors in corals. Can I use it with him? Please let me know. I am looking forward to your answer as I am so keen on giving him Iodine. We have had him for around 2 weeks and the pack of iodine has just arrived yesterday. Thank you so much for your help. I had cats before but have never known having a yabby could be so much fun. We love him dearly and want him to live well and happy. Will you reply my email or I have to keep checking the website everyday? I was so looking forward to your reply. There are 2 problems occurred since my last email to you. 1. Yabby has been really down since. Not eating for 2 days. I even tried the meat treat that he loves. He did not touch any food. He has been very shy for the last two days. Before if people came close to the tank, he will show who is the boss. But now he just run around hiding. That is not to mention the sleeping all day schedule. I thought he was dying yesterday. But when I tapped the tank, the quickly responded by getting in further, trying to hide every bit of himself. We have a big mug as a cave for him, it fits him perfectly, if he doesn't move. Does he need a bigger cave that he can move freely in? Anyway back to the problem. Is he molting or dying? I am worried so much. 2. Iodine issue. I am trying to put Iodine in the water but it was a bit tricky. I am quite confused with how much I should put in. Does that mean I need a Iodine measurement test kit to test the current Iodine level in the water? What is the Ideal Iodine level ppm for yabby? I've read somewhere it is 0.06 for coral. Please help. night I found those two. Do I have to also make sure the ammonia is at 0 and nitrate is 0 too? Thank you so much for your help and I hope my yabby won't die before I get your next email. He is our first marine pet so we are not very confident with how to take care of him. Sorry about the image, I am sending you the link to it. I am confused about the dosage that I should use. The small pocket has 1,2,3,4 level of measurement while the large one count in ml. Which one should I use? Never thought it could be so tricky. Attach is the photo of the cap. It is divided into 2. Which side should I use? I am also sending you photo of the yabby, it has some white things on its claw. Are they harmful? I also saw a white little thing moved around its claw too, tiny and white, like some kind of worm. Couldn't catch a photo of it though. As I am writing to you, he is getting a bit better, moved out of cave, walked around, carrying gravels, everything but eat. I am worried as he has not been eating for 2 days. He stepped on the food but did not care. It turned out my Yabby wanted to molt. He molted last night when we slept. I was so relief. Now I have 3 short questions to ask you. 1. I know yabby eat its own shell for calcium, but should I still give him some food? 2. I bought him a new bigger tank, and I think I shouldn't move him until he gets as hard as normal, am it right? 3. The new tank is 2 ft one, and I am planning to use 2 drops of Iodine every week, is it enough? Thanks so much for your time and answer. Sorry for bothering you again, but is it normal that crayfish does not eat after they molt? Mine has successfully molted, but he has not eaten anything since Tuesday, and he molted Thursday night. He is still not eating now. I am worried again. I drop food into his tank, but it is hard to take them out as they become too soft to catch. I use crayfish food from petstore and shrimp pallets. Well currently I have been searching all over the web, asking any LFS employee I can, and even going to the library to find a decisive answer about my questions so I hope you guys can help. I have a ten gallon setup with a Red North American Crayfish and about 6 shrimps colors ranging from blue to red to yellow (Yes, I know he will eventually eat them but right now the Cray is still tiny and I figure if he does eat them when he gets older it would be a decent source of protein) I have 2 10 Watt Aqueon Coralife mini compact fluorescent 50/50 Colormax lamps, an Aquaclear 20 filter, a couple caves and such for hiding/molting purposes, an aerator/air stone, and finally 20 pounds of CaribSea Super Natural Moonlight sand. Now here's the thing I added plants about a week ago to improve oxygen levels so I wouldn't need that noisy aeration system anymore. Having plants supplement the oxygen contents through photosynthesis rather than the aeration? I have no idea but it kind of makes sense no? Anyways, I never put any type of nutrient rich layer underneath the sand because I was not planning on setting up plants originally and was wondering if I absolutely needed it in order to promote my plant growth? As of right now I only have two types of plants; Anubias barteri and Anacharis. They look okay but the Anubis's root is sticking out of the substrate. Not sure if the crayfish named "crawl the warrior king" (gf's idea) has been uprooting it at night or what but every time I see him he seems to be leaving it alone. so I ask is there anything I could do to promote the plant growth without harming crawl and his warriors? there. Thanks for taking the time to help me out. Hi, I recently purchased an action-air aquarium ornament for my blue lobster, its a pirate and he moves his arms up and down to take a drink from a bottle. I was wondering if that would be bad to keep in the habitat with my lobster? Additives: I add bicarbonate soda (1 tablespoon per 24L), triple does Wardley's dechlorinate (we have high levels of chlorine in our tap water and there is also Chloramine), rock salt at 1 tablespoon per 24L, Easy-Life fluid filter medium (10ml per 30L). I have read on WetWebMedia that iodine needs to be added to crayfish tanks so I am getting SeaChem iodide as well. Hi, Thanks for the fast response! I should have been more clear, I am very bad at putting across things in text. The Cray is only with minnows, Danios and shrimp atm, I am getting a new tank solely for the crays and shrimp. I am purely looking at what to add to the 55 tank the crays will be leaving if I make it into a high flow tank. I had previously moved the snails following an incident discussed on WWM. however should they want to they can burrow or leave the water onto some floating wood, even lay eggs if they please. Is this understanding correct? Are you able to advise me to a sand sifting temperate (22C-ish) species that will aid with the DSB for me to consider? Is there such a thing as a cool water 'filter feeding' shrimp? target temperature from 22C to 24C? With regards to the Danio / Minnow combo, I will just move the Danios with the Crays into the larger tank when it arrives and leave them out of this high flow build. I should point out however that in my scenario it is the minnows picking on the Danios, although not enough to prevent them spawning, yet. I do not intend to make a Hillstream aquarium at all, merely to borrow the high flow in one direction idea a Hillstream tank uses. Which from my understanding is the only type of tank a filter feeder should be kept in, and beneficial to WCMM, is this incorrect? Is it not correct the adding brine shrimp and daphnia on regular intervals with give filter feeders sufficient food? (my lfs has a good stock of live foods) If not I will give them a miss. If the snails are not bothered by the fish I assume this removes the need to be removed for aestivation? If not I have several hospital tanks running for such occasions either way. I do follow the applesnail.net site, however I found nothing regarding whether they are ok in a flowing setup, apart from that if the snail has a syphon it is typically from stagnant water. This leaves me in a pickle as the name of the snail is 'snail under the bridges' if I am not mistaken, which would indicate that they are found in inland rivers. Will they be ok in high flow, assuming they get the necessary yearly break you advise on? The minnows and snails are the species I want to tailor this display tank for, I don't mind removing the snails should they need it yearly and have the spare tanks ready for such occasions. Just to clear up, I know the risks with crayfish, they are nothing to do with this tank, other than they will have previously been in it. Please can we keep the crayfish warnings at a minimum :) I have maximum respect for what you and the crew do and what you know, however this topic is about what I can do to improve the quality of life for my minnows and snails in their own enclosure and it is becoming more about my crayfish, which where only mentioned as background information in the first place. <Hello Veronica. It's almost certainly poor environmental conditions that are to blame. 20 litres isn't enough space for anything but the smallest crayfish, so if your chap has a body length above, say, 5 cm, he really needs a bigger home. Filtration is essential, not optional, and diet should be based primarily on green foods, not fish. Do read about the needs of these animals, and pay attention to water quality, water chemistry and the use of iodine supplements. I have about 25 crawdads in a 10 gallon tank but none of the crawdads will hurt the other crawdads. I know that the crawdads are supposed to fight others but they wont fight and they are standing on the rocks out of the water and 3 of them have eggs. I have no idea what to do!!!!!!!!!!!!! I didn't want my crawdads to fight it is just that they are suppose to but they didn't so I wanted to know what was wrong. And for the eggs why wont the females lay the eggs. The eggs are already fertilized over spring break but the crayfish wont come out I have no idea why. please tell me step by step on what to do for raising eggs starting from introducing the male and female to introducing the next generation. thank you. 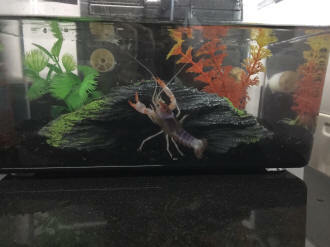 My son has 5 small crayfish (2"-3") in a 75 gallon tank. They all seem to get along OK, no major fights and only occasional skirmishes. However, they have all developed a condition where they seem to have white feathery things growing out of their sides and white fuzz around their faces. The white feathery bits seem to have a bit of red in them, at the ends. I would like to send a picture, but I don't have an appropriate camera. I found on your site that this is apparently caused by a poorly executed molt, caused by poor nutrition and poor water conditions. That was all I could find. We *were* overfeeding them on protein, as the article described. 1) What exactly is that stuff? Is it a fungus or what? 2) How do I get rid of it? 3) Does it hurt the crayfish just by being there? 4) What exactly are the ideal water conditions for crayfish? 5) Since they all have it, is it contagious? I have never kept fish before. My husband fancies himself something of an expert, but knows less than nothing about crayfish. Please help. My son loves his crayfish. I would hate to see them all go belly up. P.S. I really appreciate what you are saying about well-written letters. It is appalling what some people will consider as communication, even in printed matter. People do not realize what a difference it makes when you are clear about what you say. I looked over your site until my eyes are ready to bleed, and I did find a little more info. Now I know to buy algae pellets and only occasionally give a shrimp pellet for a treat. Is Once a week appropriate? We also noticed that they love corn, peas, and edemame beans. Is this ok to feed them, too? I also know to give them iodine and to change the water 25% a week. What I don't find that I wanted to know is, when I stick a test strip into the tank, what is it supposed to say? I found only passing references to these things. So specifically, what am I testing for, and what numbers do I want? but I am not so sure. The pet shop guy tried to sell me something to treat the water with, but hubby told me not to buy it. We have nasty rusty well water at home. but we drink the city water. Can we use the softened water, or is the city water better? Thank you so much for all the helpful information. Sorry to be a bother, but I wanted to ask you, what are the ideal Ca and Mg concentrations for the water? <Doesn't matter the exact values, but something on the "medium hard" to "hard" scale of whatever test kits you use should work just fine. While pH should be in the basic range (7.5 is ideal) the hardness is critical too. Generally, if you have water that furs up kettles quickly, you should be fine. But to be on the safe side, adding Rift Valley salt mix at about one-half the amount of stated for Malawi cichlids will do just fine. Cheap, easy, and effective. face-fuzz seems to be going away. I know we have to take better care of the water, but it is a relief to see them feeling better, anyway! 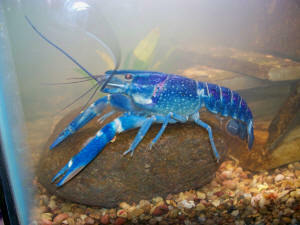 I recently acquired an almost mature electric blue crayfish. It was identified as a male and will trust in that as I have no way of knowing different. He is approx. 6-1/2" - 7" long. I have had him for one week, in a 60 Gallon tank at 74F, low KH, med-high GH, ph of 7.0 to 7.3, nitrite and nitrate do not register on my tests. 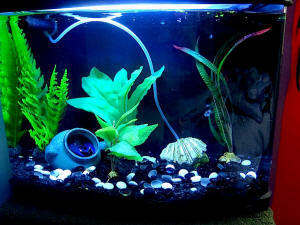 Roommates are 2 small (3-1/2") leopard Botia, 6 mystery snails and, until today, 10 small (2-1/2") comet goldfish. The tank was recently set up, about 4 weeks ago. Goldfish moved to a cooler (non heated) environment. Loosely planted with live plants. 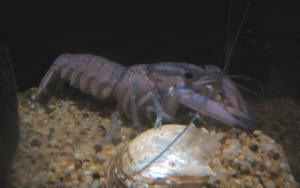 <Crayfish are primarily vegetarian, and while they eat meat given the chance, most of their diet is plant material. Needless to say your plants will be viewed as a salad bar. At least some of those plants look like "non aquatic" plants -- and these WILL die underwater. The fern at the far left front is one non-aquatic that will soon die. Take it out. The next two plants at the front might be Anubias, but they might also be Spathiphyllum tasson "Brazilian Swordplants". Again, these are non-aquatics and WILL die. Stacked slate to hiding spots, etc. Bottom filtration, external filtration. I noticed this evening a few, very small (1-2 mm or less) bright gold 'dots' on his carapace. I recognized these as he was scratching or rubbing himself with his feeder claws. There are a couple on the 'head' section, one on the thorax and one larger (3 dots) colony on the tail. Since this is a new set up and he was recently acquired from another fish person with multiple tanks, I am guessing that the gold dots are parasites, but I am not sure what may afflict this type of crustacean. I know there are anti parasiticals that are available that are suitable for use in tanks with crustaceans, but have never heard of a fresh water version specifically for their (crustacean) treatment. Do you know of such a product...or am I wrong and this is a fungal infection? Pics of tank and Crayfish attached, and the gold dots are clearly visible in the second section of the tail, to the right of the thorax (as viewed in pics). Darned things seem to have appeared overnight. (please note that the cloudiness in the tank is from fluorite substrate (specific to the planted areas only) that had not completely cleared from RE-planting the plants that my blue demon crayfish uprooted) Are the 'dots' something that I shouldn't even worry about? I have kept fish for many years, but have never had this particular incidence. It makes me think of 'gold dust' or velvet in its early stages in fish, but no other species are affected. Any ideas? <Fish parasites -- Ick and Velvet -- won't parasitise crayfish, though their infective stages can of course move from tank to tank via the wetness on the shell of a crayfish just as they can via a wet bucket or wet net.